The Organization Cloud File Server provides the similar type of capability that the office FileServer provides. It enables domain users to be managed, file permission to be set and shared, groups to be formed, auditing to be taken, notifications to be generated, and much more, plus it can work with several files stores and information clouds. You can find more about the Organization Cloud features from the business section on our website. This section of the Wiki goes over the options that are available to Organization Cloud administrators to help administer the Cloud File Server. This section should be read in full prior to setting up users for a Cloud File Server so that the options available are understood fully. On first login users will see the same type of home screen along with their last login time and the IP address location of where they logged in (for security). Admin users have an extra set of sidebar features titled “Organization” that enables them to manage their Organization Cloud Domain. If you find that the Organization Cloud Name is not correct or not what you wanted then you can change it from “My Account” on the sidebar. Your Cloud File Server admin name is normally the name of our company. The login for users invited becomes <username>@<Admin login name>. 2 Using your own Cloud Storage - what's the difference ? The Cloud File Server comes with Storage that is hosted on Amazon S3 using our keys which are not exposed. If you wish to use your own S3 Account or any other Cloud Storage provider that we support then you can of course do this, either in conjunction with what we provide or to replace entirely the storage provided. For example if you already had an Amazon S3 Account and wanted to use this for your Company Storage, the Cloud File Server Admin could add this from the Providers section of the DashBoard. If you wanted this to be the default storage that is used for Shared Organization Folders you create then you will set it to be the primary cloud and create (or convert) shared folders that your users can then access and use (unless you choose to restrict access to these folders with permissions). Conversely you could also do this with Google Docs or any of the other 25 Clouds we support. Every Cloud File Server user has a default directory structure with user level files/folders that uses this storage. The Cloud File Server Admin can designate public Organization Folders that become shared areas for files that all users can see and post to (based on permissions) that also uses this storage. 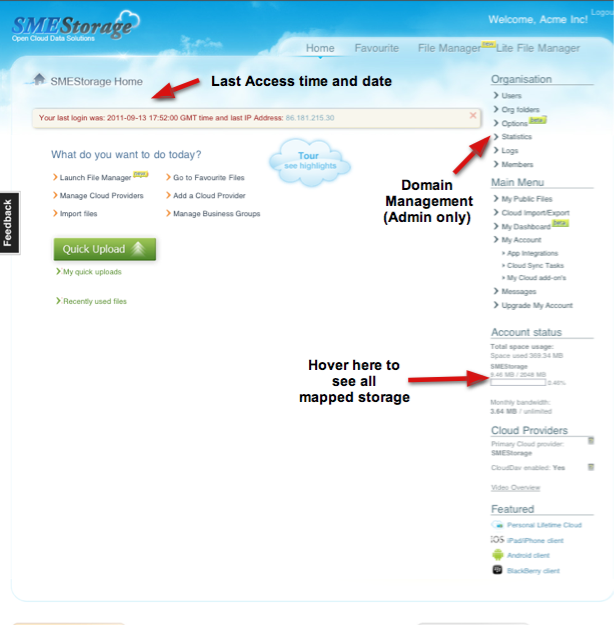 Additional Clouds can be added (or removed) by clicking on the 'My DashBoard' sidebar link after Admin login. Only the Cloud File Server Admin can add clouds unless the Admin permits users to add private clouds for their own accounts from My Account →Options→'Org members can add private clouds'. (this is useful if you wish to let users add their own Google Docs Apps accounts for example). Up to 10 clouds can be added but only one can be the 'default' or 'primary' cloud. The default cloud is the cloud used for creating any Organization folders and it is also used for desktop syncs, email backups, (and memo and voice memo syncs if using the mobile tools). 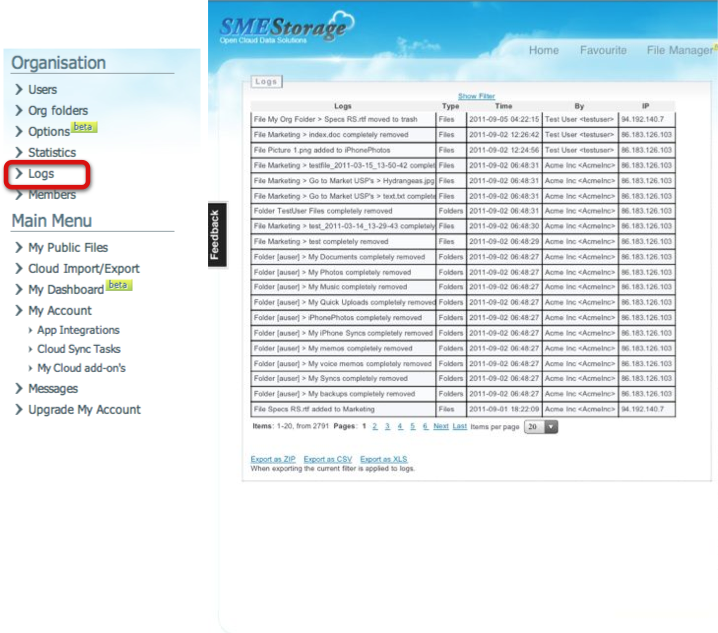 If you add a Storage Cloud other than Storage Made Easy and want to make this the default cloud for the Organization and users, the Admin must click on the 'set default' to the right of the cloud. Changing the Primary Cloud from Storage Made Easy to another Cloud will change where user stored files are saved. If you make this change after some user files have first been saved to a previous cloud, the user will still be able to download these files. It just means that any new files will be saved to the new primary storage for users that you then set. 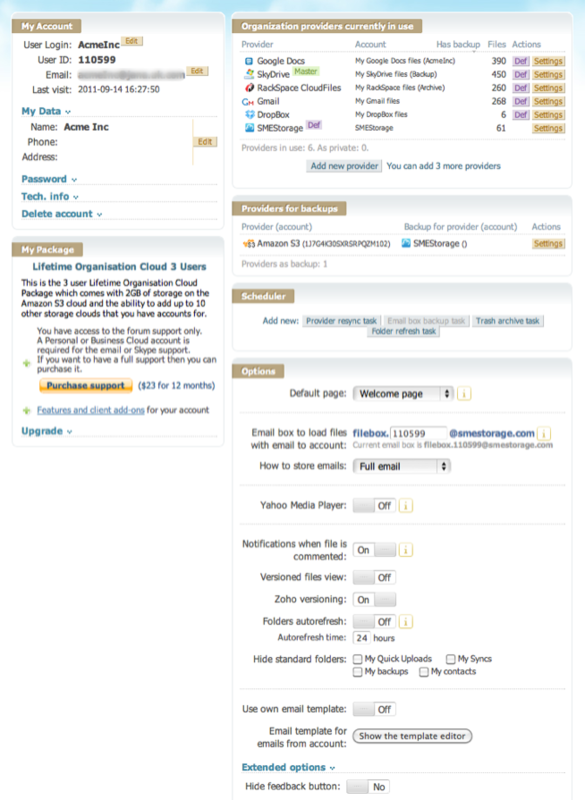 Each Cloud provider you add may have some options relating to Chunking. For a more detailed explanation of chunking please refer to the 'file splitting' section within the Wiki. The options for Chunking at global Cloud File Server level either turn 'on' or 'off' chunking for all providers for the account (“File Chunking allowed by default”) and they also enable you to set a default file chunk size for all Providers in the account. This setting will override the default global setting of 100MB. 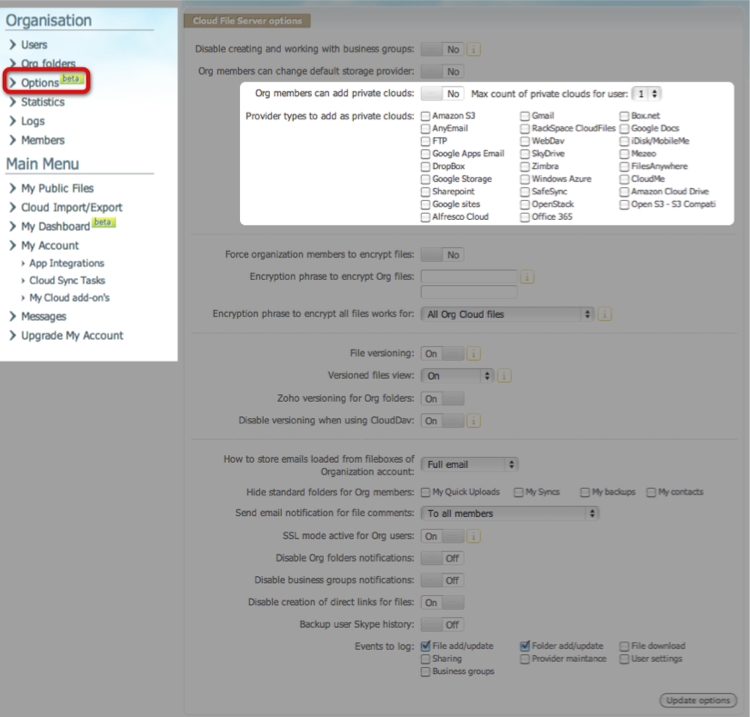 There are more detailed settings for each cloud Provider by clicking on the 'settings' link next to each cloud provider. If you have given users permission to change their primary cloud, which you can do from My Account→Options then you can check what a user has changed it to from the “Users” link. Beneath their username is their default primary cloud for user data. If you use your own nominated storage Cloud as the Primary Cloud for sharing company data (rather than what Storage Made Easy can provide) with users then you will want to understand how files are stored on the Cloud Storage Provider you have nominated. Any folders that you create as Organization shared folders will have the same folders structure on the underlying Storage Clouds that you create them on. If the user saves files in the root of their Storage Made Easy file system these files will be appended with the users name on the actual Storage Cloud that the Admin has set up as the primary (default) for the Cloud File Server. If the user saves files in Folders within the root of the Storage Made Easy file system (such as Quick Uploads or My Documents or any folders they create) then these folders will be appended with the users name. Any files or folders within this appended folder structure will not be appended with the users name. The reason for this is that the Cloud File Server is a multi-user environment and there needs to be way to distinguish similar files that are uploaded from different users. Users can easily create the same directory structure and even the same files and without such naming conventions on the underlying Storage Cloud it would be possible to accidentally overwrite files. 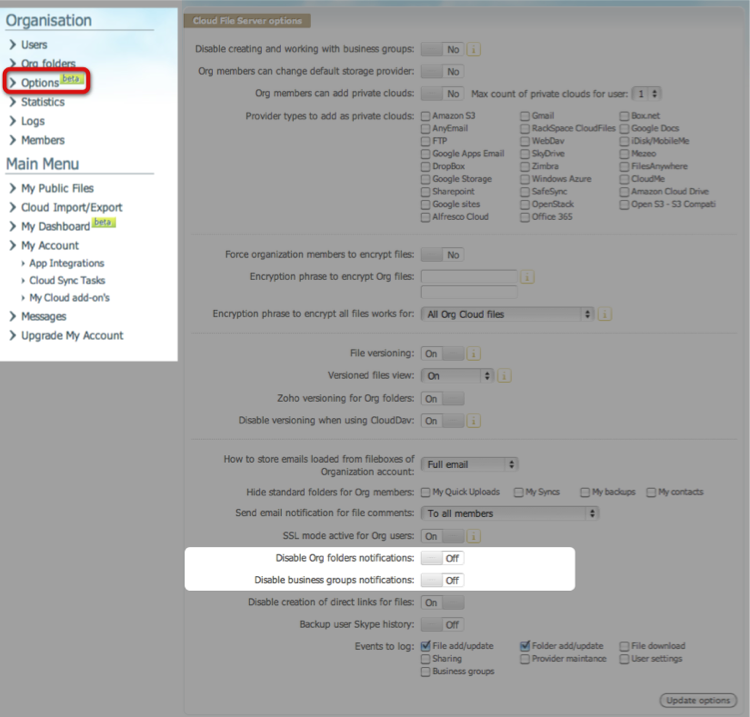 You can add Organization Cloud users when logged in as the Cloud Admin user by clicking on “users” from the Organization options on the sidebar. You can choose to either add users yourself and distribute the user information or choose to have the users invited via email in which they set themselves up. 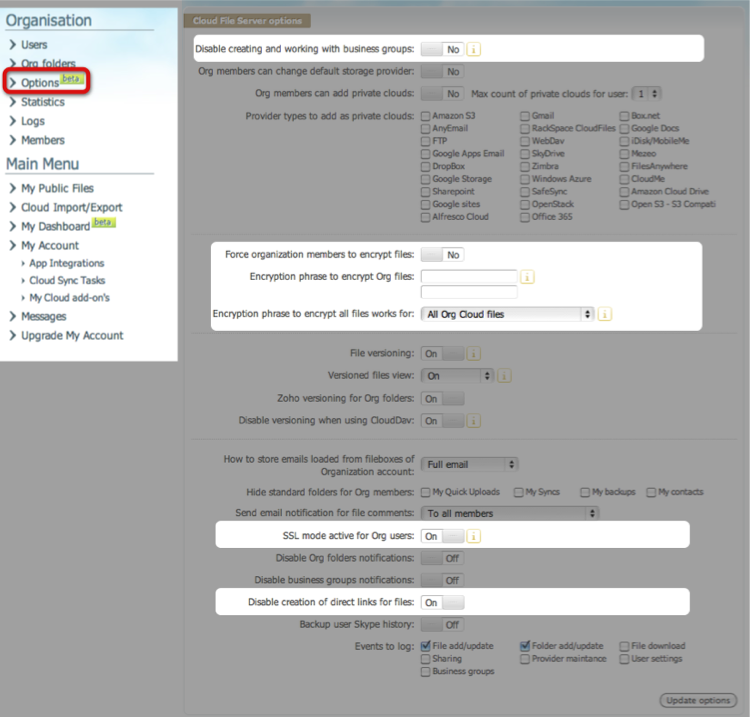 All usernames become <username>@<Organization Cloud name> for the purpose of logging in. If you add a new user in which you register the user details then you can choose to either give the user the details yourself or click the checkbox and have the details sent to the user. 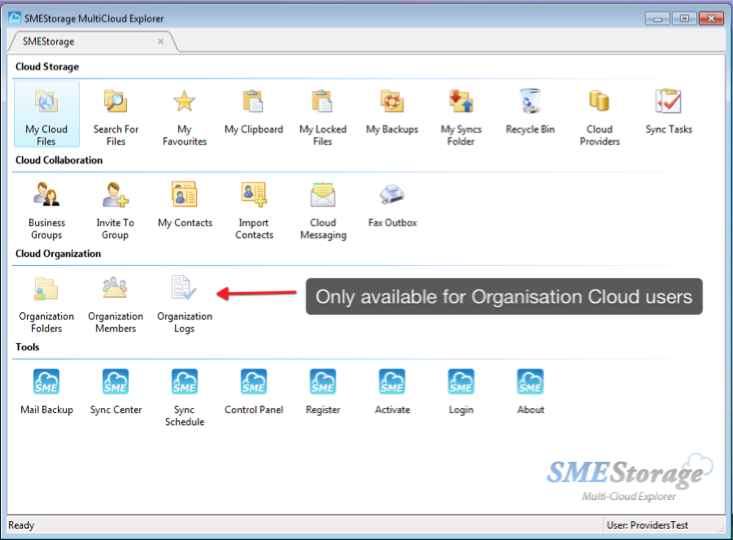 Cloud File Server Administrators can choose to create special folders by checking the “is Organization folder” checkbox. A special folder is created that is denoted by a briefcase on the web. In the example above we have created an Organization folder called 'Marketing' that, in our example, is stored on Amazon S3. 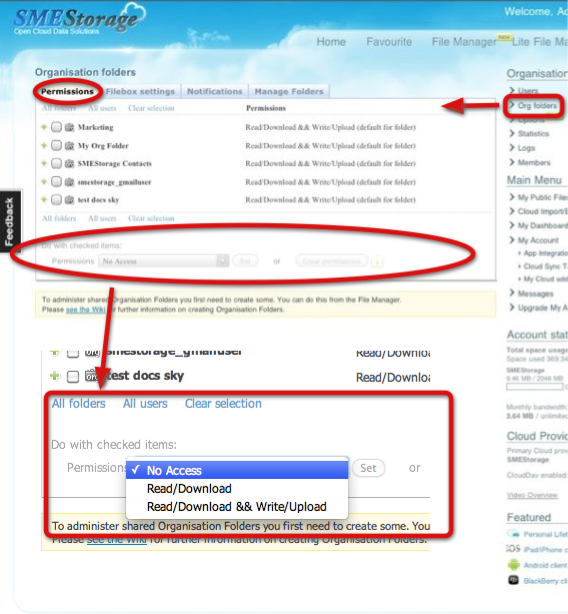 When an Organization folder is created all members of the Organization Cloud can automatically see this folder (if they have the correct permissions), and any content the folder contains, in their file tree when they login. It is a great way to keep users updated on company information. Organization users can also upload to these folders if they have the permissions to do so (see Folder Permissions). Shared Folder can be seen from all desktop, mobile and other clients, if the user has permissions to them. Launch the Cloud File Manager. Click on the folder that you wish to make shared. As soon as you click rename, then all users will be able to see this folder and all its content, unless you set permissions limiting this. As previously outlined, an Organization Folder is a folder that is shared by all the Organization and it is created by the Cloud Administrator. Examples of such folders are “Marketing”, “Projects”, “Human Resources” etc. The folders can be created from either of the two web file managers or from the windows client tools. Once the folders are created the Administrator can assign 'access permissions' to the folders for the users of the Cloud by Clicking on the sidebar link “Org folders” and choosing the 'Permissions' tab. If a user has no access to an Organization folder then they will not see the folder at all in their file tree. If the user has read / download permission only the will not be able to upload to the folder. This will enable you to assign permissions to it. Having emails in inboxes appertaining to Marketing, or Human Resources, or clients is fine, but itâs easy for this to be âlostâ in some users inbox and not available to the whole department. 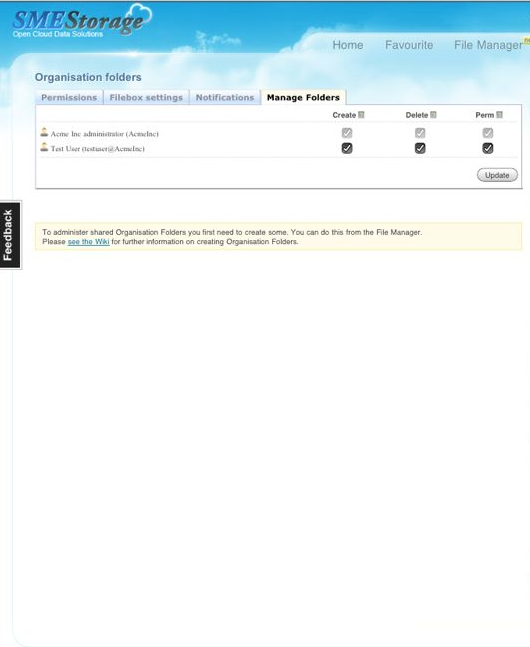 FileBox changes this because it allocates a unique email to each Organization Folder is created and each user of the Organization Cloud can send or CC an email to this folder and the email will be stored as a text along with any attachments so that it is instantly stored in the correct place and available to all Organization users. Cloud Admin's can choose the keywords for the Organization Folders they have created so that email information and attachments can be sent directly to this folder. The subject line becomes the folder name. Folders can be mapped to different to storage clouds so ultimately your data will end up storage on the storage cloud of your choice. 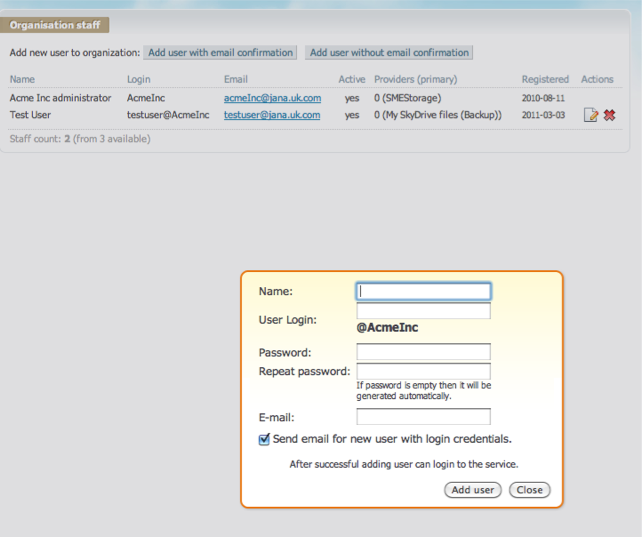 For Security, FileBox is only accepted from Organization Cloud user registered email addresses. This means the email address that the user is registered with on the Cloud File Server. You can check this address from the Members screen. Any emails sent from any other email addresses are ignored. If you wish to add supplementary emails addresses you can do this by going to the “Cloud Add-On's” section from the sidebar and choosing to purchase the ability to add another email address. The option as to whether to store the text of the email and the attachment or just the attachment can be set, when logged in as Admin, from the My Account sidebar link → Options. You can find out more about FileBox from the blog post here. The Cloud Admin can choose to setup notifications on Organization folders so that users are notified of new types of content when content is uploaded to an Organization folder, deposited there using FileBox, or changed. The Cloud Admin can decide to restrict the types of content that notifications are set against using rules and can also decide on the notification message that users receive, as well as deciding which users receive notifications and which do not. The notification is in the form of an email, sent to a user who has been assigned to receive notifications but if you have integrated a Twitter account, and enabled SMS for direct messages (on Twitter), you will also receive an SMS message, as well as an email, when notifications are triggered. We are using Twitter as a pseudo SMS gateway in this scenario. As a Cloud File Server Administrator you can choose to let certain users also create Organization Folders if you choose to do so from Org Folders→Manage Folders tab. Permission assigned can be 'Create“, “Delete”, and “Permissions”. This enables the File Server Admin to choose to let users create, delete and assign permissions to Organization Folders they create. By default folders that users create will be available to all members of the Organization Cloud unless the user chooses to restrict permissions. The Cloud File Server Admin will always have full permissions. 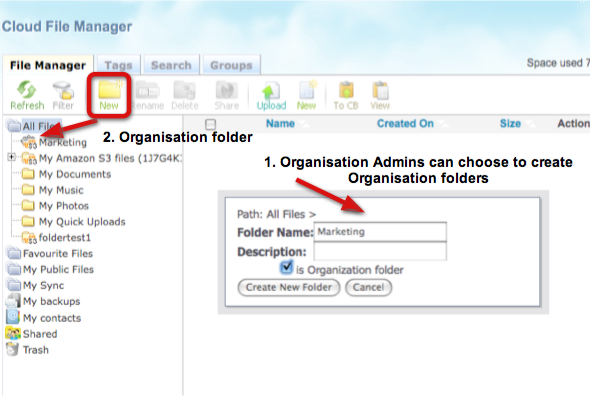 Organization users can see who has access to shared folders by clicking on the Org Folders link and then the permissions tab. 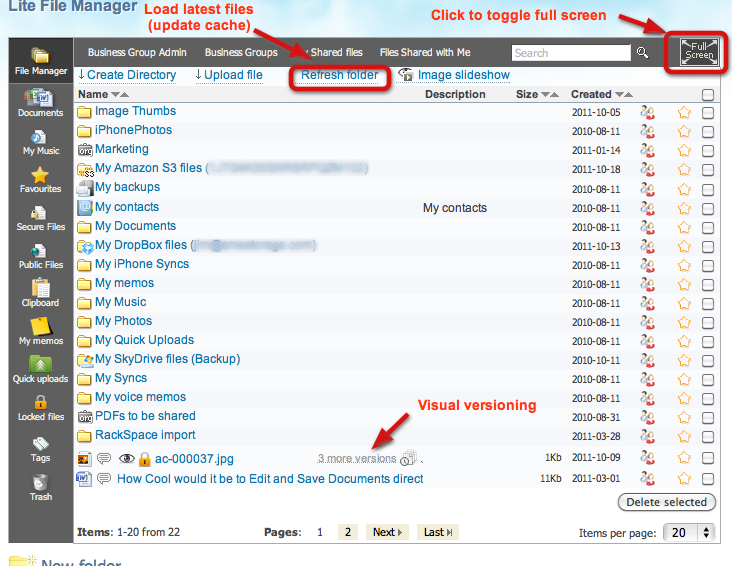 In the Web File Manager you will be able to access prior versions of a file by clicking the versioned drop down link. This will show all prior version of the file which you can access and view. If you wish to promote a prior version then you can click on the actual file link and choose “Make current version”. This will promote the file to be the current version and the version replaced will be timestamped with the time and date that it is changed. All comments will be assigned to the new version of the file. Files from any Cloud Provider can have comments. In the Web FIle Manager and Lite File manager there is a comments icon. If you click on this you can make comments against the file. When a user makes comments then the comments will be place hierarchically by date/time and username. The comments can be exported and downloaded as a HTML file. The Windows Cloud Tools also support the ability to read and make comments on files. Each Organization user (including Admin) can enable file comment notifications by navigating to My Account→Options tab and choosing to turn on “Notifications when file is commented”. This will result in the user receiving an email when a file they have permission to view is commented. If the user has mapped Twitter to their Storage Made Easy account, and have enabled Twitter to work with their phone, then they will also receive a Twitter direct message delivered as an SMS when the file is commented. Twitter is used as a psedo SMS gateway. The Cloud File Server admin can turn of comment notifications for all users both for shared folders and also for business groups. Not all organizations require these folder structures for their users, and the Cloud File Server Administrator can choose to hide these for all Cloud users from the Organization→Options. 1. You can choose an encryption password that all users will have set against their data when they upload /download to the Cloud via Storage Made Easy. We store this password using AES-256 bit security and use a seed from a key server prior to set the encryption. Without this all users of the Cloud can choose which files to encrypt on upload. With Individual encryption they private encryption key is not stored on the platform at ll. 2. You can set SSL mode to be on for web interactions. This will mean that all users will be forced to use an encrypted web connection for access. 3. You can choose to disable the creation of direct links for files. This prevents any file links being generated that can be used to share files. Within the Organization → Options tab for Cloud Administrators is an option for the Administrator to let users add their own 'Private Clouds'. This lets users add for example, their own Google Docs Apps, DropBox or any other accounts that they use for Cloud Storage. This is useful as it means that users can still use and access personal / private cloud storage but also still see Organization files that are stored on Organization Cloud Storage. The Administrator can control how many, and which types of Cloud are authorised for users to add. If you are administering an Organization Cloud for several departments you can check to see what bandwidth (and file space if the option is turned on) is used by each department and do an internal chargeback. Like all site functions, this also has an API so it can be hooked into a billing system if required. If you wish to use the API please get in touch with us as to how you can do this. The Admin users can choose to turn on Audit logging for all users. This can be done from My Account→Options Tab, and the level of logging can be set to only certain file events, or all file events. 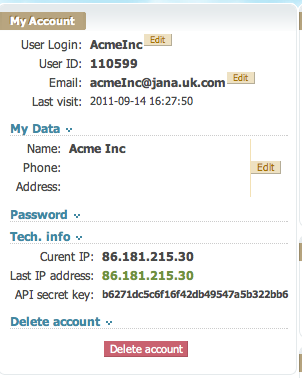 The IP address from where events occur is also tracked. The logs from the event auditing can be accessed from Organization→logs. The logs can be viewed and filtered or exported as Excel or .cvs files for external perusal and use. Having your files available on one cloud is fine, but what happens if that cloud is inaccessible ? The Cloud File Server also enables you to 'pair' a cloud with another cloud so that you data is backed up, and if one cloud goes down, we'll obtain the data from the other cloud. This gives you High Availability of your Cloud stored files. 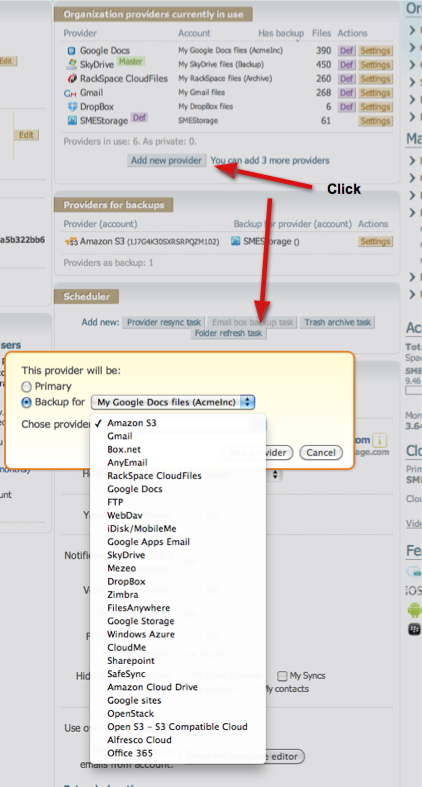 From the My Account→Providers tab If you choose to add a new cloud you can choose for it to be a cloud backup . This will sync any files from the primary cloud to the backup cloud and will then keep in sync any future uploads to achieve the goal that you have high availability of your organization files between two clouds rather than one. 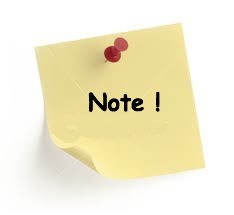 Note that only files from the Primary Cloud will be backed up, no others, and also note that by default any deletions are not removed from the backup cloud in the event you require those files in the future. Choosing the Organization staff link from the sidebar enables Cloud Administrators to send messages to all / individual Organization Cloud users. The user will receive the message next time they login. An advanced option can be purchased where this is linked to an SMS gateway in which users receive SMS messages when messages are sent from here. 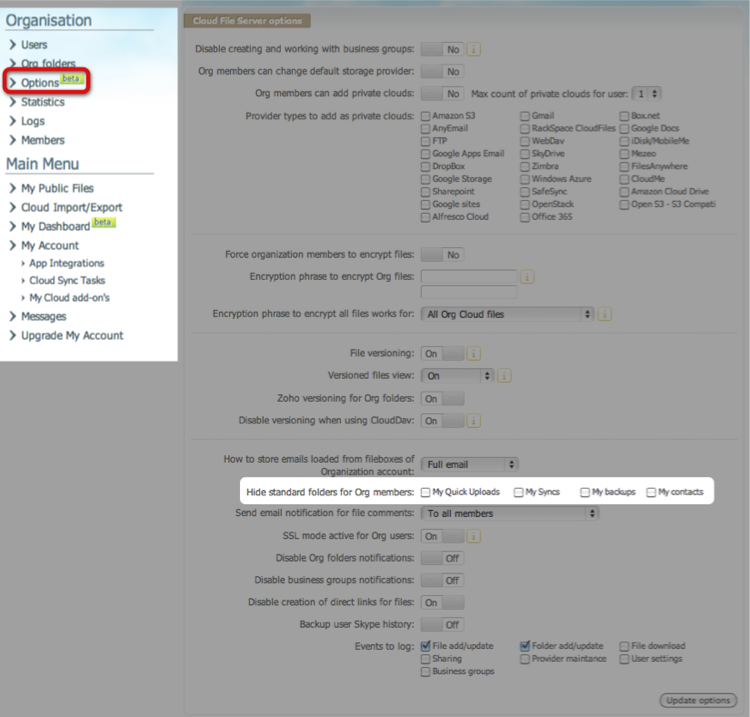 The Cloud Admin can set may options relating to the Organization Cloud from the My DashBoard sidebar link. - Account Information: Ability to change your username, password or remove your account. - Purchase Support: If your support expires you can choose to purchase support here. 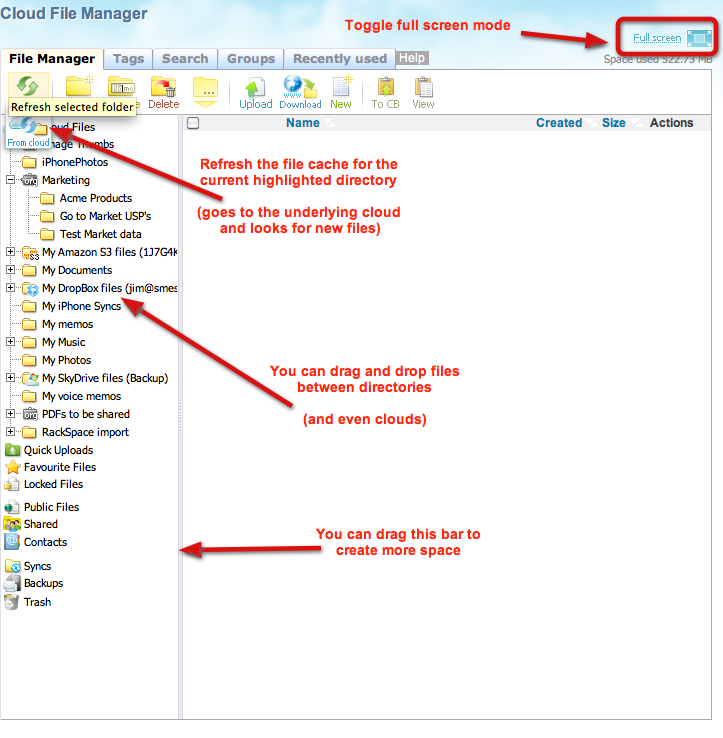 - Add/Remove Clouds: You can add/remove Clouds, change the default Cloud and access individual Cloud Settings from here. - File Chunking Options: Deciding whether file chunking is enabled. This is useful if clouds are mapped that have limited file size upload capacities. - Individual settings: These include the ability to turn of whether documents are versioned when Zoho online editing is used, whether standard folder structures are hidden, whether to hide the feedback button on the site and also whether file notification comments and versioned files view in clients are on or off. 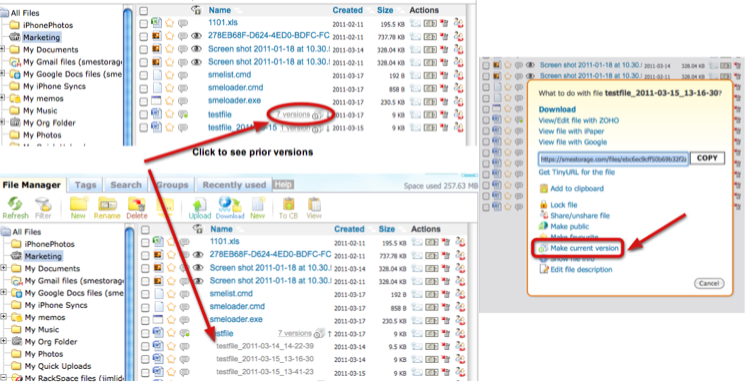 - Folder Autorefresh: Storage Made Easy can automatically discover any files and folders directly uploaded to Cloud (ie. outside of Storage Made Easy). The default timeout for refresh is 24 hours. You can set it from 1 to 24 hours. For example, if you have Google Docs mapped to Storage Made Easy and add some files directly into Google Docs in a folder called “test” and then visit this folder in Storage Made Easy web or other access clients 24 hours later, what will happen is that a refresh task will be created and the folder contents will be brought up to date so that the next time you visit the folder you will see the new files. Note: Setting the timeout time too low can result in slowness in accessing your data. Email addresses and password can be changed by clicking on 'My Account' from the sidebar. The password and username can be changed here. If an Org Administrator wishes to change the name of the Org Cloud this can also be done from here. This screen also give an Amazon compatible API key. this key can be used in combination with username and password to use certain Amazon S3 client tools. For more information on this, please see this blog post. You can find out more about email sharing, and collaborating, from a specific Wiki entry on Collaboration here. If a file is shared using the Storage Made Easy platform (rather than via creating a link) then you are able to set time limits on the file share link. By default the template for the email a user receives for the file share is from Storage Made Easy. You can choose to have the email template as if it is from your own Organization if you edit the email template from the 'My Dashboard' page. 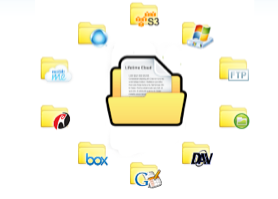 The Web File Manager is analogous to a normal desktop file manager except it is accessible from your web browser and it is actually present a “cloud file system view of the all the storage clouds that you have mapped to your account. The File Manager can be expanded to be full screen and become an “App” within the browser. You can toggle back to see Menu options at any time. The tabs enable you to access different features including Tags, Search, Collaboration Groups and and any recently used files. More information on the file managers can be found on the Wiki here. The Lite Cloud File Manager is an alternative File Manager to the normal Web Cloud File Manager for Organizations that perhaps have restrictions on certain browser features or are limited to using older browsers. Both file manager provide the same view and have almost the same functionality. The File Manager can be expanded to be full screen and become an “App” within the browser. You can toggle back to see Menu options at any time. A dedicated Firefox Plugin can be used to work with an Organization Cloud if the Firefox Browser is used. It enables batch upload and download of files as well as the ability to create Org Folder's for Cloud Admin's and to share files, make files public, get file URL's etc. You can find out more about the Firefox plugin at its Wiki page here. If you require versions of the plugin that only work with https then please contact us. A dedicated Chrome Plugin can be used to work with an Organization Cloud if the Chrome Browser is the Organization Browser of choice. It is fully featured and can be a useful addition as a means of using a browser client to manager files. Further information can be found from the dedicated Wiki entry on the plugin. Organization Cloud Administrators can also use the Windows Cloud DashBoard to directly administer the Organization Cloud. Their login enables the Organization features of the DashBoard so that they can add Organization folders, member,s check logs, add / refresh cloud providers, etc ie. the same options that are available via the web interface. If you deploy the tools to your users then the Organization options will not be available, neither will the ability to administer the Cloud Providers, except the Cloud Providers that the Admin has enabled the user to add/access. Further details on the Windows Cloud Tools functionality can be found on a dedicated Wiki entry. Further details on the Mac Cloud Tools can be found on their dedicated Wiki entry here. 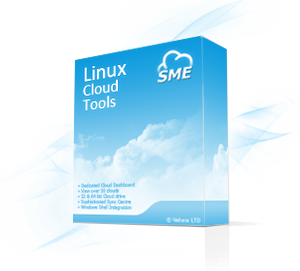 Further details on the Linux Cloud Tools can be found on their dedicated Wiki entry here. Currently none of the mobile clients have Cloud File Server Administration capabilities. 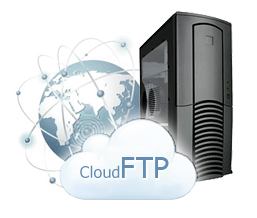 CloudFTP adds an FTP entry point to the Clouds mapped to your Cloud File Server account for Cloud Administrators and all users. This works for Clouds that don't even natively support FTP and works with normal FTP clients. More information can be found on a dedicated wiki entry here. 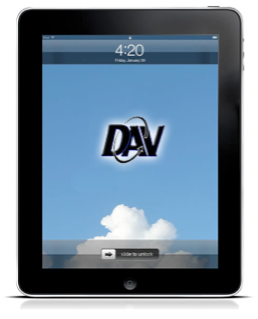 CloudDav adds a WebDav entry point to the Clouds mapped to your Cloud File Server account for Cloud Administrators and all users. This works for Clouds that don't even natively support WebDav and works with normal WebDav clients. If your team uses iPad's you can use this feature to natively edit and update documents directly from iWork (Pages, Numbers, Keynote) on the iPad. Remember if there is something that you require from the Organization Cloud or something that does not quite work the way you want it to, contact us. We are very receptive and open to hearing from you and if what you want has broad appeal amongst our user base then we are happy to consider implementing it, or it may even already be available, just not exposed.